The $270 million Epworth Geelong private hospital opened in 2016. Putting patient needs first and adapting to technology trends are two of the key goals in healthcare today – and both are a feature of the success of Geelong’s newest private hospital. Epworth Geelong launched onto an already-crowded local market three years ago, providing a state-of-the-art facility in an area with a fast-growing ageing population. At the heart of the organisation, you will find modern workflow methods and customer care more in keeping with high-end hospitality. It has flourished despite the presence of three nearby rival hospitals, forging a close relationship with the local university. 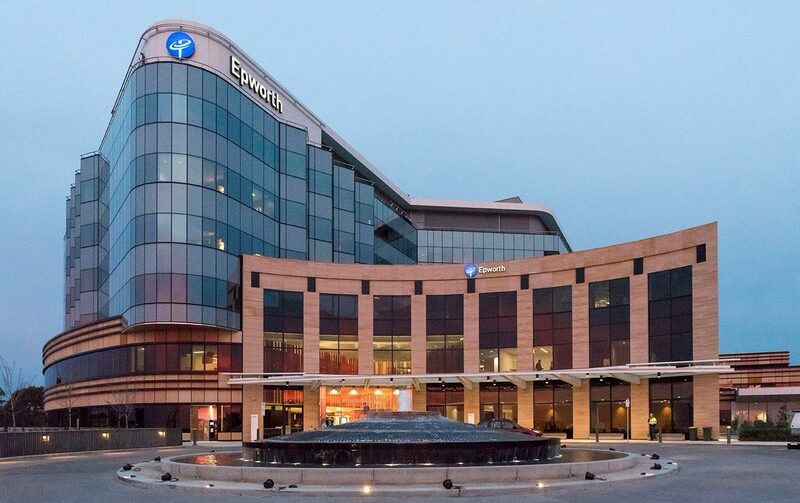 Along with the Epworth group’s long-held goals of education and research, this strategy has attracted not only specialists but also their patients. 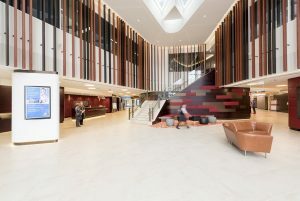 “Younger specialists have seen it as an opportunity to establish a new footprint in a new region, so they’ve seen value in it,” Epworth Geelong CEO Damian Armour said during a tour of the $270 million complex on the opening day of the Australian Private Hospitals Association’s 38th National Congress. “You get the specialists and promote them to the GPs, and the patients will come. But we’ve also been very clear on making sure the patients who do come get a great experience, so when they’re discharged and go home and talk to their families and friends, they can reflect positively on the experience they’ve had at Epworth,” he added. These positive experiences are reflected in Epworth Geelong’s impressive feedback results. It rated in the 96th percentile of 266 Australian hospitals in the international 150-300 bed group and the 85th percentile for the 1,500 hospitals in the database, while its Net Promoter Score for January-March was beaten by only two percent of hospitals in the Australian benchmark. The hospital carries out regular questionnaires – as per Epworth policy, seven patients discharged per week per ward get a survey. 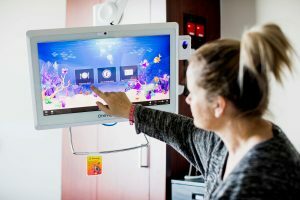 The Point of Care touchscreen terminal is installed in each patient room. A central feature of the hospital’s consumer experience is the ‘Point of Care’ system – a shared device installed in every patient room, which acts as a hub for everything from TV, internet and clinical education to medical results and records, plus an integrated meals on demand service. Doctors and nurses can use them to access the hospital’s main system via biometric thumb-print readers. ‘Meals on Demand’ is an innovation for Epworth. Patients place their orders on the Point of Care touchscreens from a restaurant-style a la carte menu, and they are fulfilled by catering staff who are integrated into the clinical teams. 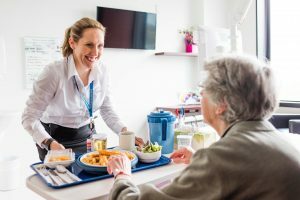 Known as Ward Hosts, they not only deliver meals but also help patients with the Point of Care system, assist with the ordering, prep the food, monitor fluid intake, and report any issues to the clinical staff. “There’s a little more labour required but it works, it does make a difference with patients – people talk about the experience with food in the hospital,” Mr Armour said. Epworth Geelong’s Ward Hosts are integrated with clinical teams. Established outside the inner-city grouping of three hospitals – one of which, Geelong Private, has since shut – Epworth Geelong is built for growth. It has a number of ‘cold-shell’ spaces waiting to be used – its current 168 inpatient beds can swell to 262 if needed, while the seven operating theatres can be increased to 11. The ICU capacity can double to 12 beds and there is a second cath lab on hand. The rehab services, featuring two gyms and a hydrotherapy pool, also have room to spare. In a region which is outstripping the state population trends, especially in older age groups, it is not only located just 200 metres from Deakin University but it is also near the new Armstrong Creek development – which is expected to provide 25,000 homes and 50-60,000 residents. The state-of-the-art complex at Epworth Geelong was completed in just over two years. As the two-year construction process began in 2014, Mr Armour, himself a local, set about engaging the community to introduce the Epworth group identity along with director of clinical services Leonie Lloyd. Then the hospital’s only employees, they started the recruitment process 18 months before the hospital’s planned opening – seeking online expressions of interest. “Our goal, especially for our senior positions, was to know we had at least one or two appointable applicants for every job before we advertised,” Mr Armour said. “We did our first employee experience survey in November 2017, and it says we’re doing really well in terms of engaging our staff and trying to keep them,” he added, citing stats which put the hospital well above the national benchmarks, for a workforce which has grown from 400 to 1,000 today. The hospital’s partnership with Deakin University is joint-funded with the Federal Government, providing an on-site lecture theatre, seminar and tutorial rooms, and video conferencing. “We’re doing about 4,000 student days each year already,” Mr Armour said. However, the hospital – and its patients — remains his prime focus, as growth continues to spike. “The challenge with a new greenfields hospital is a continual increase in occupancy,” he said. “Melbourne metropolitan is also growing closer to Geelong, so in the western parts it’s probably quicker to get to Geelong than it is to Melbourne – that’s another market opportunity we’re looking at. “We’re behind the business case, but it was a fairly aggressive one. We reset our budget every year and have been consistently ahead of the annual budget that we’ve set. From that respect the board and the group CEO and myself are pretty happy, but there’s still a lot of work to do,” Mr Armour concluded. Read more: Reimagining healthcare – What does the future hold? Previous ArticleReimagining healthcare: What does the future hold?